The second section in Andrew Farley’s The Naked Gospel is called Religion is a Headache. I couldn’t agree more. The idea that our relationship with God is dependent upon us, and our works, is not only burdensome but untrue. The nature of justification is that it is an act of God’s free grace in which He imputes the righteousness of Christ to all who receive Christ as He is presented to us in gospel. It is not increased nor decreased by our works, good or bad. The trouble is, Farley never defines justification. Farley never defines sanctification, and never distinguishes between the two. This is at the root of the problem. Like Roman Catholicism, he does not distinguish between the two. Unlike Roman Catholicism which then declares that faith AND works are necessary for justification, he says that the law has NO role in our sanctification. He continually makes two appeals. The first is that “legalism” as he defines it, makes Christianity look unattractive to non-Christians. Our lack of joy and satisfaction resulting from our misunderstanding of Christianity drive people away. The second is to say that if we are to follow the Law we must follow ALL of it, and how absurd it would be for us to follow the 600+ laws given in the Pentateuch. 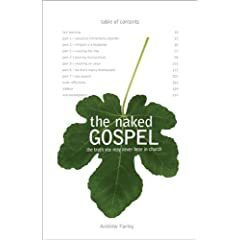 An acquaintance asked me if I’d read The Naked Gospel: the Truth You May Never Hear in Church by Andrew Farley. Read it, I hadn’t even heard of it. He provided me with a copy so he could get my impressions of the book. The packaging was a bit different, and fairly cool. In the first few pages I knew that danger was ahead. Sometimes I think pastors should not write books. They assert things without demonstrating how they are true. This book suffers from this problem in spades. Sorry I’ve already shown you my cards. It starts provocatively with a quote from Arthur Bury, whose 1691 book entitled The Naked Gospel was burned by the church of his day. This sort of sets up a martyr complex of sorts if he too is rejected. That is a noble and desirable task. I have never heard of Arthur Bury, but other influences of note are Hannah Whitall Smith (author the The Christians’ Secret to a Happy Life which I read decades ago) and Andrew Murray (a devotional writer). They are advocates of Christian passivism often portrayed as “let go and let God”. Pastor Farley is very excited about discovering this view. Sadly he bases his theology on the work of devotional writers. There is no evidence of research into the work of any respected pastor-theologians or respected theologians past or present. This lack of exegetical depth beneath the popular treatment is sad. In some ways I don’t blame him for his excitement. His description of his life before this discovery of “the naked gospel” was one of intense legalism and frustration. He was laboring under a serious misunderstanding of the gospel. He believed he must do certain good things to maintain God’s acceptance. Sadly, I fear he went to the opposite extreme though he denies being an antinomian. But he uses his own unsatisfactory definitions of both legalism and antinomianism rather than the usual theological definitions. This is proof positive of why studying the Marrow Controversy is so important to us today- it addresses the very issues at play here. So, any use of the law as a guide is legalism in Farley’s mind. This is far different from relying on the Law for your initial or continuing acceptance from God. Farley defines antinomianism is as being against the law, not a theological, exegetical or practical view that the law has no place in the Christian’s life. But we get ahead of ourselves. Here is a quiz he offers, answer whether or not each statement is true. Christians should ask God to forgive and cleanse them when they sin. Christians struggle with sin because of their old self within. We should wait on God even before making everyday decisions. When we sin against God, we’re out of fellowship until we repent. Old Testament law is written on Christians’ hearts so we want to obey it. The Bible tells us that Christians can obtain many rewards in heaven. Christians will give an account for their sins at the great white throne. Christians should tithe at least 10 percent of their income to the church. God gets angry with us when we repeatedly sin against him. God looks at us as though we’re righteous, even though we’re really not. He says the answer to each one is false. His book then sets out to show why. And we’ll examine that in posts to come. 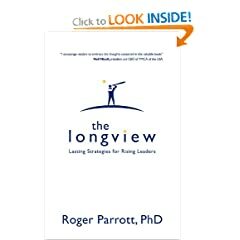 The 4th chapter of Roger Parrott’s The Longview: Lasting Strategies for Rising Leaders gave me plenty to ponder. I’ve been mulling over it for a few weeks now. It is entitled Vulnerability May Get You In, but Humility Keeps You There. He there outlines some of the differences between transparency and humility which can greatly affect one’s ability to lead a group of people. I’m part of that transitional generation when transparency began to be advocated after generations of a lack of transparency from leaders about their shortcomings and mistakes. Parrott writes some things to challenge this. At first I am thinking, they need to know I’ve struggled and God has been faithful. They can’t see me as impervious to sin or above struggling with things. I’ve talked about my struggles to put unrighteous anger and selfishness to death. But there are struggles I’ve not shared publicly. I may share them in private ministry, but not for everyone’s ears. This is the key thing, substituting vulnerability for humility. They are not the same thing, and sometimes vulnerability is driven by pride. Either pride in wanting the spotlight, or in manipulating others to follow through the sharing of secrets. Parrott notes that many a vulnerable pastor had bigger secrets that lead to a public moral collapse (think Jim Bakker & Jimmy Swaggart). Vulnerability makes you vulnerable, in the wrong way. You are not merely accessible to others, but leave the gates open for the hordes to attack and oust you. I’ve experienced this as some people have turned the table on my transparency. They hide behind the claim that I will get angry and yell at them, without any prior evidence for this. I have been yelled at many times- no one seems to be afraid to yell at their pastor. As leaders, we must remember that people are not basically good. Some people will use the truth against you. Humility is the most important element of leadership. Humility means being willing to listen readily instead of thinking you have all the answers. They think about, and talk about others more than they think and talk about themselves. But this humility is combined with an “intense professional will”. This person keeps others focused on the organization and its goals, and how they fit into the plan rather than how the leader fits into the plan. Most often, effective leaders are able to influence people without direct confrontation and exercising power. As Mark Driscoll talks about, control and influence are inversely correlated. The more control you exert, the less influence you will have. One way in which humility fits in here is the teachable spirit. A teachable spirit, a willingness to listen to one’s critics, minimizes power differentials. Unteachable leaders maximize the power differential and reduce their influence over others. This fits well in the longview. To remain longterm, you must be humble and teachable. This means you will learn to work with others in light of eternal perspectives rather than using powerplays to achieve short-term victories. This Sunday I’ll be preaching on Christ our Hope to kick of Advent season. I’ll hit Matthew 1:1-14, discussing the hope(s) the Israelites had due to God’s promises to Abraham (Gen. 12) and David (2 Sam. 7). I’ll talk about the seemingly interminable delay in the fulfillment of those promises. As is often the case, my mind went back to The Shawshank Redemption. It is one of my favorite movies. The movie is essentially about hope, and its ability to sustain a suffering man. Their hope had nothing to do with Christ, but ours does and is much greater and more powerful (Paul focuses on hope often in Romans). I’d play this edited clip on Sunday, but there is an inappropriate word near the beginning. Includes the exchange about hope between Andy and Red after Andy’s time in solitary, and the ending when Red discovers that hope is not as dangerous as he thought, but is really- the best of things. Life being like it is these days, CavWife gifted me with a tiny book by Mark Driscoll for my birthday. It was from his A Book You’ll Actually Read series. This little book is On Church Leadership. Cheap, simple, and you can read it in an hour. Mark Driscoll will guide you through the 6 important areas of church leadership with clear Biblical teaching and a raw sense of humor. You’ll explore the topics eldership, deacons, members, and women in leadership—with plenty of surprises along the way. What is lost in Mark’s sense of humor. His personality is submerged, for the most part. His personality is part of what makes reading his books so enjoyable for me (and I recognize what that says about me). But Mark’s insight and experience remain, which is what makes this book still worth reading. It would make a good book to give to officers (present and potential). He explains a nearly-Presbyterian form of church government tweaked to be more effective in this day. In some ways he is a tad too pragmatic, but we Presbyterians are too “traditional”. The form of government, which I believe to be biblical, is unchanging but how we apply it should be adjust for time and place. So, I can appreciate what Mark is doing but I just can’t go with him everywhere he goes. That’s okay, though. In his introduction he faces the reality that even church people have what NBA great Bill Russell called “little red wagons”. They have agendas other than Jesus and His kingdom. He talks about this in other books. Here he applies it to church government. He’s also honest about our struggle with authority, and how people’s refusal to submit to proper authority almost killed Mars Hill in the early days. He moves on to Elders. He affirms the plurality of elders. He dares to say what needs to be said. He reminds us that the qualifications for elders are primarily those of a mature Christian man. The first part of that is vital- mature Christians. It is too common for churches to nominate popular or powerful men. Businessmen will run the church like a business. But mature Christians, tested as family men, will run the church like a family, seeking to lead others to maturity. And they are men- in accordance with Scripture- which is not a popular statement today. Back when I worked for Ligonier ministries, I often talked with the “Born Again Guy”. This was my name for someone who often called to discuss what it meant to be born again. I did not like talking with him. He was convinced that his novel ideas were true, and refused to ground those ideas in a sound, reasonable interpretation of Scripture. I had many a painful, pointless conversation with him. I wish I had a copy of Finally Alive then, because I could have sent it to him. Perhaps John Piper would have made more progress with him than I did. In his recent book , John Piper sets out to explain and apply the doctrine of regeneration. He has a valid concern that the term “born again” has been removed from its biblical moorings. There is a great ignorance about the biblical concept, and this misunderstanding has lead to many problems within the church. It is at the root of much of the church’s problem with sin. Piper’s desire is for this book to clear the air and restore the glory of God in regeneration. Don't judge it by the cover! Piper approaches this subject by exegeting and explaining the key passages that this subject. The key passage is John 3, and this takes up much of the book. He also spends significant time in 1 John and 2 Peter as he unpacks the implications of this significant doctrine. The chapters in the book are short. This is not a bad thing. I was able to read a chapter during my 30-minute lunch break each day, slowly working through the book. So while the material is not easy, John Piper provides enough for people to digest at each sitting. He does not overwhelm people with lengthy chapters. There are far too few books that cover this material. I agree with 98% of what Piper says in this book. The one thing I disagreed with him on was the meaning of “water and the Spirit”. He thinks the “water” is a reference to the cleansing we receive (of which baptism is a picture) in regeneration (he argues this point from Ezekiel’s promise of the New Covenant). I take an approach more akin to Leon Morris’ in that it refers to physical birth. I think this due to the parallelism I see between verses 5 & 6. To be born again, we must be born the first time, in the flesh. Jesus is speaking of water and birth. The interpretation that makes most sense to me is water referring to birth, being born of the flesh. This is insufficient for us to see, or enter, the kingdom of God. We are powerless, but utterly dependent upon the work of the Spirit to give us life in Christ. This difference is fine tuning, and has little/no difference in application. But this text and others are clear to both of us that regeneration precedes faith rather than follows faith. Piper labors to show the truth and significance of this truth. Scripture teaches the regeneration is a significant change that produces faith in us, grants us the power to resist temptation and so please God. It does not just produce a relational change, but also a spiritual, moral change. Regeneration is mysterious, but that does not mean it is irrational. Scripture connects it with the ministry of the Word. As Calvin often noted, Word and Spirit are joined together. The Spirit grants us new life through the ministry of the Word so that we then believe the Scriptures. We then begin to obey the Scriptures as well. Not only that, but we begin to make the Scriptures known that others may be born again. Scripture is clear that God’s appointed means for faith is hearing the Word, through others. We are responsible to engage in evangelism. It is Scriptural. It seeks to understand Scripture in a cohesive way. He’s not proof-texting, but seeking to examine texts in their context. It is gospel-centered. All sound doctrine is in accordance with the gospel. This means it is connected, in some way, shape or form, to the gospel. It is practical. He shows the implications and applications of the doctrine. As John Frame has oft said, we do not truly understand a text until we apply it. Piper does just that. Once again John Piper has written a book that many won’t like but need to hear. It is not just about theological minutia, but reminds me of Charles Simeon’s criteria for a sermon: Does it humble the sinner? Does it exalt the Savior? Does it promote holiness? This book achieves all three of these goals. I’m slowly working my way through The Longview: Lasting Strategies for Rising Leaders. It is a book I wish was written years ago, I could have benefited from it. I have been busy, and actually read the chapter Applause Lasts for a Moment, but Leadership is for a Lifetime last week. The chapter carries over some ideas from the previous chapter on ego. One aspect of that is hogging all the credit. Some leaders, or people in leadership positions, are driven by ego and want all the credit for success. They want the applause. But this ultimately undermines a leader’s ability to lead. What often gets in the way is our insecurity and need for recognition. This drives away others, particularly those who helped make us successful. This insecurity also refuses to accept any blame for failure. Insecurity dumps blame on those it refused to honor for success. My mind went to a work situation I endured. The organization was shifting directions and models every few years. There was not a stable, consistent vision or process. At one point they brought in a new CEO who looked good on the outside (he talked a good game) but was what I called “a small man”. He was insecure. During a called organizational meeting he yelled at 2 departments for what certainly sounded like uncharacteristic mistakes. Those departments had been very busy lately, but there had been no word of thanks for handling the extra workload. I made the mistake of going to his office to encourage him to encourage them for the hard work they have been doing since they were all discouraged after his tongue-lashing. He wasn’t there but the message was passed on. Soon there was another meeting in which any unhappy employees were invited to place their resignation letters on his desk by 5 pm. The organization was walking on eggshells for quite some time. People were demotivated. I couldn’t wait to get out. This person was driven by his insecurity: he was not able to share credit or blame. He took all of the first, and none of the second. He was a poor leader. I’ve also been in organizations where some departments were seemingly invisible. The leaders spent all their time with other departments, neglecting others. It created a great sense of disconnect, envy and discouragement. But another person came to my mind. That person was Patriots’ quarterback Tom Brady. Brady has always shared his success with his teammates. Not just privately, but publicly. This past weekend was no exception, he talked about how the offensive line worked hard to give him the time to find the receivers who worked hard to get open. The team worked for that win. This is also evident in the nationally run commercials he has done. Unlike other star QBs, he includes the members of the offensive line. He honored them with some of the spotlight (and some extra cash). Don’t you think they are extra-motivated to protect him? Earlier in the year the Patriots were struggling, particularly on offense. Tom Brady took the blame. He didn’t throw anyone else under the bus. He said he needed to work harder and make adjustments. Tom Brady is a secure leader who remains successful because he takes the long view. He needs everyone else to succeed. So he consistently shares the credit and accepts the blame. Be Purposeful– if you don’t periodically set time aside to do this, it will get lost in the busyness of leading. Check yourself by spending a day thinking of each act of appreciation you offered. You’ll find you miss many opportunities in any given day. Be Poignant– it must be from the heart and be credible. Hollow credit undermines your leadership. Be Personal– regular awards are rather impersonal. Instead personalize it, and offer it when it is not expected (before the project is done, perhaps). Be Pure– don’t do it for publicity, or a photo op. People will see through that, and it undermines your leadership. Join in the tough jobs, not just the visible ones. Be Prayerful– This will help you see them, and their needs, more clearly. Respect their boundaries, neither purposely making a show of it in the hall or by summoning them to your office for a private word of prayer. Offer to pray with and for them where & when they are comfortable. He also gives some direction for delivering bad news- direct, disclosing & discreet. How we share credit and address failure will greatly impact our ability to influence others as leaders. Too often we are driven by our insecurities or the tyranny of the urgent. Both of those problems can be addressed, and solid leadership can develop.